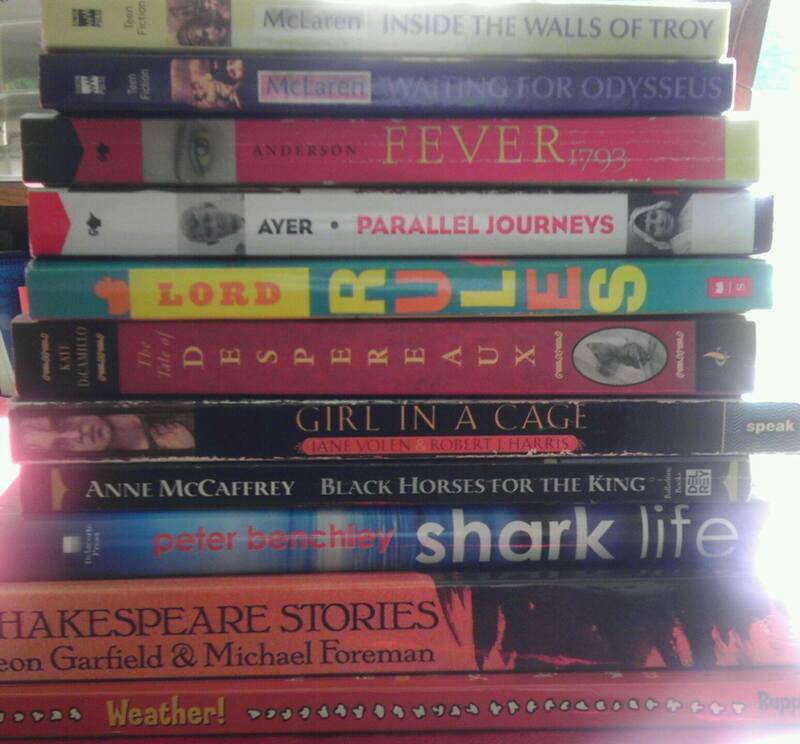 Over the next few weeks, I am going to be doing a blog series about what Literature-Based education is all about. Today, I’ll start by briefly going over what makes a book “living,” and then we’ll talk about how to choose the best books for your child. I should start out by explaining what I mean by literature. I know you may be thinking, “Doesn’t everyone teach with books?” Well, yes and no. By literature, I’m referring to what Charlotte Mason would call “living books.” I am of the belief that what actually makes a book “living” can be subjective. But the basic idea is that a living book is one that is written by an author that cares about the subject matter which he or she writes about. The author will write about his or her subject matter with a love and enthusiasm which excites the imagination and compels you to care about what you are reading. These are the books that will have lasting meaning and memories in the mind. The kinds of books that would stand the test of time. The opposite of a living book would be “twaddle.” Twaddle is a book that is dumbed-down and/or poorly written. A good example of this type of book would be anything commercialized, for example, Dora the Explorer picture books or books written in a very long series such as the Magic Tree House books or the Babysitters Club. But, I would like to add a note here about twaddle. I have read articles and books about how we must avoid all twaddle as it will turn the mind to mush. But I look at twaddle like junk food, a little bit won’t hurt you. My twins went through a phase of devouring all of the Magic Tree House books they could get their hands on – and I let them. They were reading on their own and enjoying it! Now that they are more comfortable with reading, I can give them a better selection of books to choose from. My rule about twaddle is that I don’t read it aloud – if they want to read it to themselves, fine. But I have better books to choose from for read alouds. I liken it to enjoying a cookie after eating a healthy supper. It is a book that is devoid of rich meaning, giving you nothing to think about, and sometimes we all like to enjoy something mindless, but it certainly shouldn’t be a book we use to educate our children. Many textbooks could also fall under the twaddle category. Now compare this to a living books education. While studying this time period, you might read a the chapter in your spine book (The Story of the World: Volume 2 The Middle Ages which contains a full 4 pages to tell the story of William the Conqueror and the Battle of Hastings), and then you could read a biography about William the Conqueror (there’s a nice one included here: Famous Men of the Middle Ages ), add in a novel like The Striped Ships written by Eloise Jarvis McGraw about a girl whose life is turned upside down by the Norman Conquests and helps to create the famous Bayeaux Tapestry, which might then lead to reading a book like The Bayeux Tapestry: The Story of the Norman Conquest 1066 . But a real books education is more than just reading a lot of books. It sounds deceptively simple, it provide piles of literature and my child will magically become educated. Having an excellent home library is part of it – studies have shown that children who grew up among books, grow up to be more successful than those who didn’t. But there’s even more to it than that. Some of the main points I want you to take away from this blog series is that we need to give our children big, meaty ideas to chew on; we need to teach them how to find information for themselves so that they can further their own education; and we need to teach them how to express themselves in order to share what they have learned. These three things are really the foundation of a literature-based education. Now that I’ve touched on some of the virtues of using rich literature in your homeschool, you may be wondering how to choose books for your child to study? I have a few rules when it comes to choosing books. Again, this is fairly subjective, but for me, for a book to make it into my home library it has to be well written, it has to be interesting, and it has to be something I myself would want to read. Just because Charlotte Mason used it in her schools over a hundred years ago does not mean your modern child must read it. And just because someone else claims it is a must read or you were forced to slog through it in high school, doesn’t mean it’s worthy of your child’s time. There is a fine line between challenging our child and boring him to tears. We need to be fully aware when we’re crossing it. The first step is to narrow your topic. Saying you want to read about the Middle Ages is far too broad. However, narrowing it down to a focus on just Knights or just Castles makes it much easier to find good literature to teach those topics. For example: you could read The Making of a Knight by Patrick O’Brian or How to Be a Medieval Knight by Fiona MacDonald and then maybe throw in a read aloud such as Castle Diary: The Journal of Tobias Burgess or The Kitchen Knight: A Tale of King Arthur by Margaret Hodges. That’s not to say you can’t cover other topics under the umbrella of “Middle Ages,” but by narrowing your search, it becomes much easier to find books that are specific to the topics you wish to study. Literary power – I love that. We want to give our children powerful, meaningful books to read. 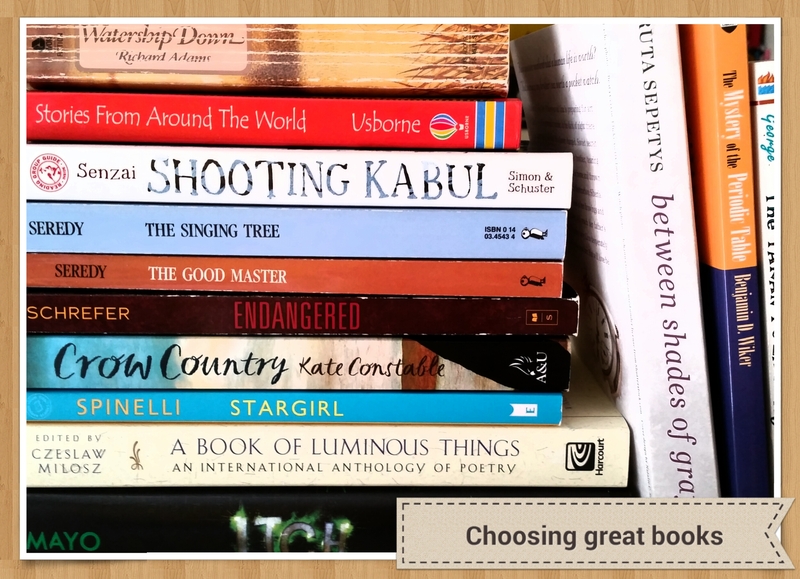 Good literature has a solid, interesting plot; vivid characters that come to life and leap off the page… it makes use of various literary elements and has rich vocabulary. A good, well written children’s book should hold your interest just as much as your child’s. If you find it dull and simple, chance are good that your child will too. 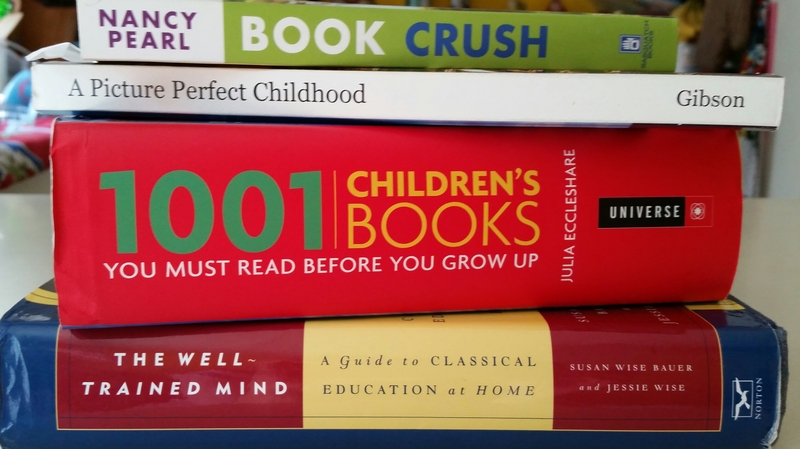 Start with a reliable book list – you can use the Build Your Library amazon bookstore list to get started, or books like Book Crush: For Kids and Teens by Nancy Pearl, 1001 Children’s Books You Must Read Before You Grow Up or any other Charlotte Mason website. The one caveat I would give with Charlotte Mason sites is that many of them assume that for a book to be living, it must be a classic at least 100 years old. However, there are plenty of beautifully written modern books of all genres. I think there is a danger in only allowing old-fashioned literature into our homeschools – many are full of outdated ideas and are therefore hard for children to relate too, and because the language is often unfamiliar it can make comprehension more difficult. Especially with younger children, this could turn them off of reading. You never want reading to become a chore. You want it to be something that they look forward to – the best part of their day. That isn’t to say that you should avoid all classics. There are many that you absolutely should read. Some of my favorite children’s books are classics – Winnie the Pooh, A Little Princess and Anne of Green Gables are by no means current, but are beautiful works of literature that should not be missed. But to ignore books like The Tale of Despereaux by Kate DiCamillo or The Mysterious Benedict Society by Trenton Lee Stewart, simply because they weren’t available in Charlotte Mason’s day would be a travesty. But there are too many books! I can’t decide which ones to use! I go through this all of the time. Sometimes you have to let this process happen naturally. It’s especially hard when I’m excited about a subject. I’m a bit of a World War II buff – especially when it comes to the Holocaust. I know, I’m morbid. If there is a book about it, I’ve probably read it. 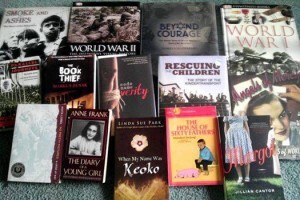 So when it came time to cover that time period with my own children, my book list was a little ridiculous. I knew we wouldn’t really get to all of it, but I planned it all out anyhow. And in the end, we only read a third of the books. My kids aren’t missing out because we didn’t read everything on my original list. They gleaned quite a lot of information without them. And they’re still young! They may come across those unread books later. And sometimes, you’ll start a book that you thought would be a hit and your children are just not on the same page. The rule at my house is that you have to read at least 4 chapters of a book, and if you are still bored, it’s OK to stop reading it. There are just too many books to force yourself through something you aren’t enjoying. Now, I do adjust this rule a bit when we hit high school age, because sometimes you do have to make it through a book whether you like it or not. But when they are young, you want to keep reading an exciting, enjoyable experience. Sometimes just reading one good book is enough to cover a topic. Living books can form the heart of your child’s education. 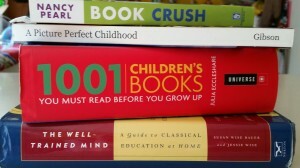 I have spent years filling our little homeschool with books that would fit that purpose. My home is brimming with literature – from Tomie de Paola’s folk art style picture books to Shakespeare to Tolkien to A.A. Milne and Madeleine L’Engle. I have shelves of science books and history books, poetry, art and geography, I’ve tried my hardest to hit all “subjects.” But I always hold each book to the Living-Books-Test. Is it written by an author who knows their subject? Does it hold my attention? Does it bring the subject to life? Does the story live and breathe? If the answer is yes, that book earns itself a place on my shelves. Choosing great literature for your child doesn’t have to be a challenge. When you choose a program from Build Your Library curriculum, you can be sure that your child will be reading and listen to some of the best books that are currently in print. They’ll be surrounded by some of the greatest children’s literature and you will fill your shelves with beautiful thoughts and ideas for them to dwell upon. WOW Emily, what a wonderful article! I enjoyed it thoroughly. Thanks for sharing your expertise and your passion for beautiful literature. I love “literary power” too!